Have you had one of those days where you can't decide what clothes to wear? I was rummaging through my closet and I couldn't choose anything. So I tried to look into my sister's pile. I found a purple blouse, which I wore to get my prize from Hello to Earth author, Lilia. You can check out my article about it in my previous post: Winning and Purple. I still had time that day so I decided to color my nails purple as well. 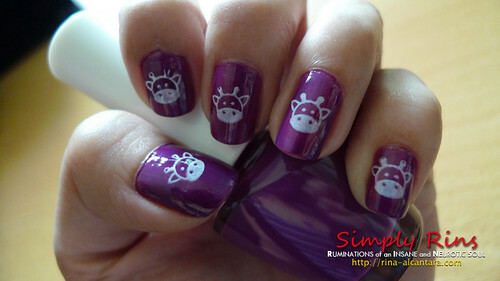 This is 2 coats of Faceshop's purple nail polish. Top coat was added after stamping the nail art. The color is a little translucent. Having this is 3 coats would look better. I just didn't have that much time to add another layer. I asked my sister to choose the nail art design from my Konad image plates. She said I should go with the cow. This is from Konad's s10 image plate. 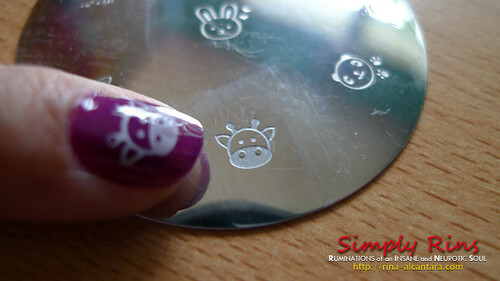 I used Konad's white special nail polish for stamping.